Sescosem was a French company that was formed during the merger of Thomson-Brandt and CSF in 1968. Thomson-Brandt has its roots as a French subsidiary of GE back in 1892 as Compagnie Française Thomson-Houston (CFTH), while CSF was a French electronics company founded in 1918. Thomson’s SESCO division (itself a joint venture between Thomson and General Electric) was merged with CSF’s COSEM division to form SESCOSEM. 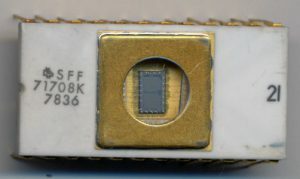 SESCOSEM made many semiconductor products for the European market, starting with basic transistors and eventually second-sourcing microprocessors. masks and information concerning the 6800 to Thomson-CSF (SESCOSEM parent) for present and future microprocessor products. Eventually SESCOSEM was able to begin making their own devices at their 2 production facilities: Saint-Égrève , near Grenoble (COSEM site) and Aix-en-Provence (SESCO site). SESCOSEM also made/sold the various support products for the 6800 series, as well as several EPROM’s, including a clone of the 1702, 2708 and 2716. In mid-1979 SESCOSEM stopped using their own logo, and switched to that of Thomson and in 1982 SESCOSEM was rolled into Thomson Semiconductor, as the French government nationalized and consolidated many industries in an attempt to increase profitability. 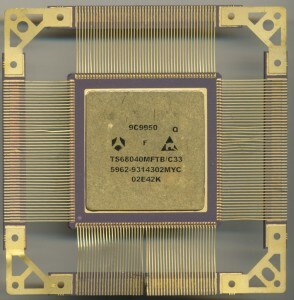 Thomson Semiconductor also included Mostek (sold to Thomson in 1985), Silec, Eurotechnique (French-National Semi joint venture) and EFCIS. This allowed Thomson to produce Motorola designs, now including the 68000 series of processors. In 1987 SGS of Italy, merged with Thomson to form SGS-Thomson, what is now known today as STMicroelectronics. While a bit convoluted, this is one reason so many companies manufactured Motorola products. This helped contribute to the world-wide success of Motorola products. No longer were they only a US product, but a global product, made and sold by global companies. In a twist of irony, Freescale, the semiconductor portion of Motorola, was purchased by NXP Semiconductors of the Netherlands in 2015, adding yet another brand of 6800 and 68000 processors. Only a year later however, in October of 2016 Qualcomm, one of the leading makers of cell-phone chipsets, announced that it will be purchasing NXP. A Qualcomm 68k processor may very well be in our future. Since its Memorial Day here in the United States, the CPU for the day needed to be something mil-spec. 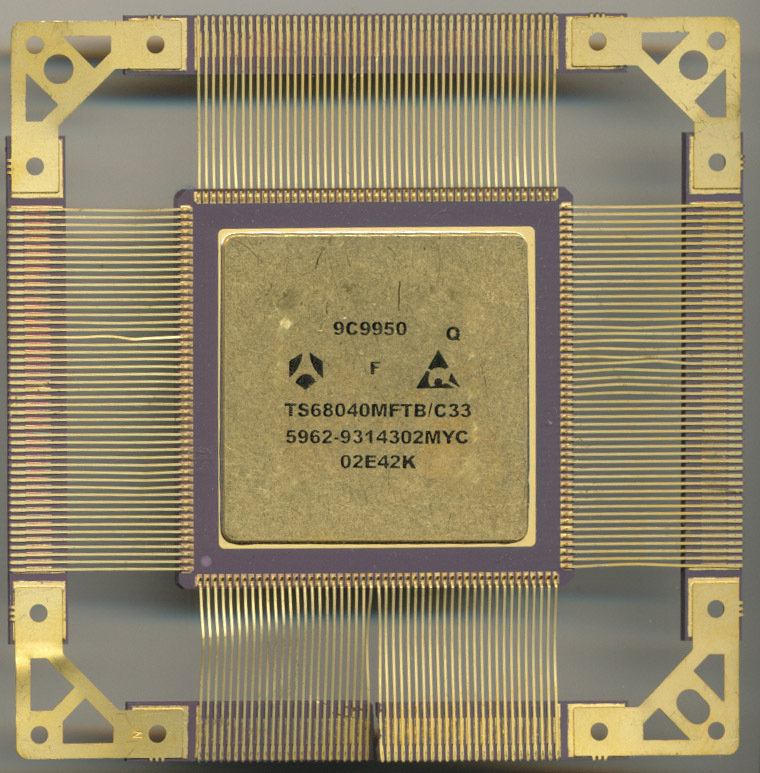 This is a very nice Thomson-CSF (part of STMicroelectronics) 68040 processor. 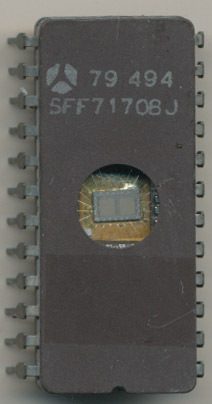 The 68040 was released in 1990 by Motorola and was the first of the 68k line to include a full FPU on chip (as opposed to using the 68881/2). This Thomson part was made in 1999. It is full military temp range (-55 -> 125C) with MIL-STD-883 Class B screening running at 33MHz. Its in a fairly rare (and available by special request only) ‘flat tie bar package’ This is similar to the more common ceramic quad flat pack (CQFP) but the leads are contained and supported by tie bars on the ends. These tie bars are physically attached to the board offering a very strong mechanical support for the processor in environments where high vibrations or higher then normal g-forces may be encountered. The life of a soldier is not an easy one, so electronics must be made to support them, and not fail.